We compare the Canon 16-35mm F/4 IS against the older Canon 17-40mm F/4 in a landscape photography setting to see if the upgrade is worth the money. After a recent video some said I should get the Canon 16-35mm to replace my 17-40mm. So I have. But I’ve been talking recently how the gear doesn’t make the photographer so I’m not totally convinced this purchase was required. So I thought I would put it to the test, possibly prove myself wrong, and help you when it comes to making your next lens purchase decision. There are certain things important to me in a lens when shooting landscape photography. Sharpness is important up to a certain extant. Once an acceptable level of sharpness is reached then I am happy. Most photographs are viewed at a reasonable distance and a normal viewer is not looking at minute details or pixel peeping an image. The overall story is much more important. When working with super wide angles like 16-20mm, distortion can become a real problem and is extremely distracting and prevalent in cheaper lenses. The Canon 17-40mm handles distortion reasonably well so I was interested to see if Canon 16-35mm F/4 IS would be better. The coloured soft edges in high contrast areas of an image look extremely unpleasant and can make an image look cheap. Also known as chromatic aberration, one major benefit of a high quality lens is the ability to control it. These days, it can be controlled in post-processing but it results can be hit and miss depending on the image. The Canon 17-40mm can be susceptible to chromatic Aberration, can the 16-35mm improve matters. When conducting a camera lens review I am also looking at build quality and extras such as IS. Image stabilisation is not important to me for stills. For video, it is much more important so it is still something I look for. In the video I pit the two lenses against each other at Ribblehead viaduct in the Yorkshire Dales. The Limestone pavement provides some big foreground interest for a shot, something I really wanted to include in the lens review. Take a peek inside my camera bag to see all the photography gear and wild camping kit that I hiked up a mountain during my latest landscape photography vlog. There is nothing lightweight about camera gear. We are literally carrying around chunks of glass and metal. This is not too much of a problem for many situations but with landscape photography it is a big issue. To get the very best landscapes it often means getting off the beaten track and carrying your gear so we need things to be lightweight. Add in a shooting video and then add in camping equipment, we suddenly have a very heavy camera bag. On my recent landscape photography vlog, where I collaborated with Gary Gough Photography, we hiked up one of the biggest mountains in the Lake District called Great End. It stands at 900m with an 800m climb from the car. With my bag as light as possible, so I could achieve everything i wanted, the bag still weighed in at over 20kg. I therefore wanted to create this video so you could see what i had with me and what I had to sacrifice and leave behind. The extra weight from the wild camping gear meant I could not bring the full range of lenses that I normally do. Water alone is shockingly heavy. On a hot day hiking a mountain you will need at least a litre of water every couple of hours. One litre of water weighs 1kg, heavy. Thankfully the water purifier meant I could carry less and refill but it is something that is vital to think about. However I still had to leave the 24-70mm lens behind. Normally my go to lens, I suspected I could get away with the 17-40mm and 70-200mm. I also didn’t want to sacrifice the drone. Despite the weight and the hard climb it was absolutely worth it once we got to the top. Enjoying challenging adventures like this though hinges on being prepared and having the right gear. Once you do you are free to enjoy the stunning views and experiences that wild camping and photography have to offer. We take a look at what’s in my photography and video editing setup for 2018. It includes the iMac Pro with an amazing 10 cores to take productivity and creativity to the next level. A really important part of any photo editing setup is your workspace. This has nothing to do with size but having a place to sit, edit and to be comfortable is going to let you be more creative and productive whatever level you are at. In the past, my spaces have been the corner of a room, I had a full blown home studio in the last place and now that the kids need more space I have this office. I am really happy with it. I have worked hard to get it right, I’ve got a new desk and it feels productive. As I’ve mentioned a few times before, on top of all this, I had been maintaining a part time job to give the family a bit of security. About 3 weeks ago I quit that part time job so I am now full time at this……whatever this is…….photographer, filmmaker, youtuber. I’m going to be doing lots of different things, both on and off this channel but virtually all of it with be around photo and video production. So right at the centre of my new setup is a new iMac Pro. The workhorse that is going to be pumping out content on a daily basis. It’s a stunning machine…..frighteningly expensive but I have invested back into all of this so I have a machine that will speed up everything I do. No more waiting for Lightroom and Premiere Pro to catch up. It is expensive but I recently sold my 2009 iMac for £500 after I bought it for £1500 nearly ten years ago. If I get the same kind of value out of this machine then it will have been well worth it. I’ve then got the iMac driving this second monitor. This is the Viewsonic VP2785. It’s designed for photographers and covers 99% of the Adobe RGB colour space and comes colour calibrated straight from the factory. It’s a stunning monitor that will act as my main editing screen for photos and also the play window when editing video. Next up I have storage. The iMac has a built in 1TB SSD which is very very fast but is by no means big enough to store all my image and video files. So for that I have this Drobo 5D3 that connects via thunderbolt. It’s fast, it currently has an 18TB capacity and it should keep me going for at least the next couple of years as I add in extra drives when required. Since this is now my livelihood I have invested in a battery backup. Just after moving in we had a few issues with the power repeatedly going off. I thought at one point I had lost everything off the Drobo which would have been annoying restoring everything from backups. I managed to get it going again but it’s not a problem I want to face again. Now if the power goes off the battery kicks in an keeps me going for another hour or so giving me the chance to shut down safely. Next is the printer. The beautiful Canon Pro 10s. I’ll be doing a video about printing in the next few weeks so we’ll discuss that a bit more then. Post processing wise I am using Adobe Lightroom. I use this for virtually all my editing these days and am going into Photoshop less and less. I use Adobe Premiere Pro for video editing and I just love the Adobe package. It works seamlessly across all your devices and just keeps you productive. 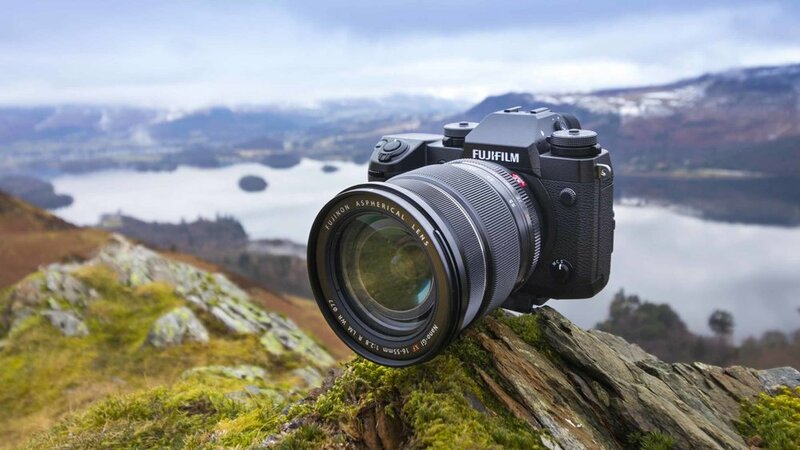 We take the Fujifilm XH1 to the Lake District to put it to the test in this real world review with a landscape photography flavour. The Fujifilm XH-1 is Fuji’s new flagship mirrorless camera and sits above the XT2 in the Fuji lineup. It has the same 24mp crop sensor as the XT2 so we know the sensor is capable of capturing some great images. Many of us need a camera to be rugged and reliable and that’s exactly what this camera is. The all new metal chassis feels rock solid and it’s weather sealed so when the rain starts, we don’t have to stop. One of the big benefits of mirrorless cameras is they can be smaller and more compact than a DSLR. This in part led to popularity of the XT2, especially amongst landscape photographers because weight and size really matters when hiking in the wilderness. It might seem odd then that Fuji have gone in the opposite direction and made this camera bigger than its predecessor, but I don’t think so. It’s still significantly lighter than a pro DSLR body so weight is still being saved over most pro cameras. However the bigger size makes it much more comfortable in the hand, especially with the optional battery grip. The comfort adds versatility and makes this camera a genuine option for photographers working with their camera all day like wedding and street photographers. It seems to be a genuine all rounder. One of the big selling points of this new mirrorless camera is the new in body 5 axis image stabilisation. Image stabilisation has never excited me when it comes to stills but it absolutely does when it comes to video. The system works really well to smooth out your shot and also breaths some new life into older lenses you might have lying around that don’t have IS. This camera is a bit of a beast when it comes to video and I’ve been very impressed. It shoots 4K, it can do 120fps at 1080p and has loads of built in video presets to vary the look of your footage including a log mode. I’ve settled for the new ETERNA film mode that mimics the look of that film but still leaves me with plenty of room for post production if I need it. Aside from that I’ve just been hugely impressed by the sheer quality of the video image. It looks sharp and punchy and just looks really good and is on a par with the Canon 5D mark iv. An external microphone can also be attached and a really nice feature is the ability to set microphone gain separately for the built in mic and an external mic so you don’t need to adjust it every time you plug a mic in. So will this be replacing my DSLR. To be honest, not at the moment. It’s very close though and I have been very impressed with the Fujifilm XH1. I have absolutely loved shooting with it today and I feel it’s definitely better than the lower end DSLR’s and also better than the Canon 6D Mark ii that I reviewed the other week They are very similarly priced. It’s not the perfect camera, there are slight annoyances like the lack of a built in bulb timer and the touch screen is not as useful as it could be but the biggest issue for me is the cropped sensor. It is a good sensor but it’s just not full frame. Like all cropped sensors any noise that is present looks harsh and kills the sharpness and you lose some dynamic range. That might not matter to you but when you think the new full frame Sony A7R Mark iii is just around the corner, at a pretty similar price, personally I would need to try that out first before finally making the leap to mirrorless. Anyway this is still a very nice camera and I have had a great time using today here in the absolutely stunning Lake District. If you decided to buy I don’t think you would be sorry. I review the Canon 6D Mark II DSLR camera and head to the Lake District to put it through it’s paces from a landscape photography perspective. If you have seen my camera reviews before you will know I am not interested in repeating all the specs and obvious elements. I want to get the camera out into the real world and use it exactly like a photographer would. In the video we look at the abilities of the camera mostly from a landscape photography perspective when we headed to Loughrigg Fell in the Lake District. The whole point of the Canon 6D Mark II is the entry into using a full frame sensor. This has a number of advantages. It usually includes improved dynamic range (not so much in this case - read on), better low light ability and least obviously - the potential to use better glass, particularly at the wide end. High end lenses like the Canon 16-35mm L are perfect for landscape photography and on a full frame camera you get the full 16mm wide end coverage. Putting this lens on a cropped sensor camera effectively increases the 16mm to a more narrow 25mm which can be limiting in some situations. Build quality of the camera is the usual Canon quality. It is a plastic build but it feels solid and secure and the weight also benefits from this. It has a flip out screen, which is missing from the higher end cameras for the sake of durability, but I find them particularly useful. When the camera is low down near a stream, or close to the ground, having the screen point up towards you is a real back saver. The flip screen means you can also use the Canon 6D Mark II for vlogging. Not a cheap vlogging option, but it is possible. Next is the image quality. There are not many cameras out there today that provide poor image quality. This camera is no different. Image quality is superb for stills and you can quite happily use the 26MP sensor to create massive prints. Sadly though dynamic range was not as good as I would have hoped, especially at low ISO. This might put off some landscape photographers who might be looking at rivals from Sony and cameras like the Nikon D750. Personally when it comes to stills I am not concerned too much about dynamic range. Using bracketing can easily capture all the dynamic range in a landscape scene. The dynamic range of the camera improves dramatically as ISO increases. Therefore, like many full frame cameras, The Canon 6D Mark 2 is excellent in low light. Any noise that does appear has a film grain type feel rather than the harsh noise often associated with crop sensor cameras. This means the camera lends itself to shooting portraits as well as landscapes. Depending on the lens you attach to the camera it is capable of capturing stunning portraits. However I would be reluctant to use it at a wedding or for any other professional portrait work. The focus system covers a smaller area of the frame than higher end cameras like the Canon 5D Mark IV which can be limiting when you have to focus and re-frame more often that you would like. Having said that, for most, that will not be a problem. The focus system is still very accurate and fast. It also has the dual pixel autofocus system for video. This Canon system is really second to none for video focus and it very very rarely misses including when using face detection. Video quality is reasonable but again the dynamic range can be limiting. When I was out in the mountains getting detail across the frame was not easy and I was often left with blown out skies. This could probably be improved by using a flatter picture setting rather than sticking with the built in presets like I did. There is also no 4K option and the 1080p quality is softer than the Canon 5D Mark IV and more in line with the cropped sensor Canon cameras. However the ability to shoot 1080p at 60fps does provide the option of producing some slo-motion footage. Overall I had a superb time using this camera. If you were to buy it, you would be very happy. Just be aware it is not a professional level camera. We should not be expecting it to be though given the price point of £$1600. Indeed, the camera only comes equipped with one SD card port. To remove the slight limitations mentioned above you are looking at upgrading to the pro level Canon 5D Mark IV which is more than double the price. The Canon 6D is an all round performer suitable for all different genres of photography and will perform them all to a good standard. In many respects the upgrade to full frame is something many photographers aspire to and this camera allows you to do it much sooner with only very slight downsides. It is a shame the dynamic range is not better at low ISO but that is being hypercritical. An all rounder at a great price point for a full frame camera. A solid 4 out of 5. What is the best vlogging camera for 2018? We look at everything from a phone up to the Canon 5D Mark IV to help you decide what is the best camera for starting your vlog. Check out the gear here. In this video we’re going to look at several cameras and decide which is the best for vlogging. First we need to decide what we are going to shoot and the level of production quality required. I am a photographer so I feel an extra level of pressure to get high quality images but it’s absolutely not required. The story you tell is absolutely the most important thing……and you, of course…we need to give our audience a reason to watch, and provide them value. Once we have that nailed we need to start looking at the gear. At the moment there really isn’t a perfect vlogging camera. There isn’t a camera out there that strikes the right balance between image quality, features, focusing and weight. Budget also comes into it so we’re gonna take a look at a few cameras and discuss the pro and cons of using them for vlogging. 4K is not really required for vlogging. When you look at the Youtube analytics a growing majority of people are watching content on their phones and tablets and they are far from having 4K screens. 1080p is the sweet spot at the moment and it makes post processing easier and quicker and storage is much less of an issue. A top of the range camera like the Canon 5D Mark IV. At the moment I am using all of these for my vlogging in addition to the drone. It makes shooting very complex especially when I am trying to capture some nice landscape photographs at the same time. It’s more than reasonable to vlog with just one of these solutions but the perfect vlogging camera really doesn’t exist yet. If you are going to start a vlog then good luck. Film your first video and upload it and forget about it. Then do that again and again and again. Stay to the end for a peek at my very first video. In this week’s extra video we are going to take a look at the new Viewsonic VP2785-4K monitor and discuss why you might need a good quality monitor for your photo and video editing. There’s just so much to think about. White balance, lighting, colour spaces and colour grading and when you are doing most things on your own, to a tight schedule, it’s tough. So recently when Viewsonic got in touch and asked if I wanted to try out their new 4k colour calibrated photo and video editing monitor I was very happy to give it a try. For full transparency, Viewsonic are not paying me but they have sent me this monitor so it’s not a completely unbiased review. However I would never tell you about something that I didn’t totally believe in or use myself. Part of the problem I have been having is colour accuracy. When you edit a video or a photograph you want to know the colour is accurate. I have been plagued with problems where I edit and colour grade a video and then it looks totally different on my laptop or my phone. This is where having a calibrated and accurate monitor comes in and is exactly what this Viewsonic VP27854-K monitor provides me. It means I can be confident that the colour I am seeing on the screen is accurate and to a standard. This monitor has built in presets for different colourspaces too. It covers 99% of the Adobe RGB and 100% of the sRGB colour space and I can switch between them freely depending on what I am doing. Most online images are in sRGB so I can check exactly what it will look like. The monitor also has an intelligent ambient light sensor that controls the output of the monitor so I have accurate colour in all circumstances no matter what the light situation is in my room. It is also a high quality panel with uniform colour and brightness right across the screen, whatever angle I view it from. This is something cheap screens really struggle with and is a big bonus. It is also been brilliant for my photography too. I want to deliver colour accurate images to clients and this is particularly important when printing. Often in the past I will print an image and the colours will look different to what’s on the screen, maybe slightly warmer or more magenta and it left me unhappy and frustrated. I dealt with this by first printing out small images to make sure the colour was right on the print before reproducing it full size. This was both costly and time consuming. With this monitor, thanks to the colour accuracy, I now do not need that step. I can go into my print screen, load up the profile for my printer and paper and the final print looks virtually the same. The Viewsonic VP2785 4K is pretty well future proofed too. Like many screens these days it is 4k but this has a high pixel density and is also ready for HDR10 content giving you those brighter colours and richer contrast. It has the new USB-C input as well as numerous other ways to connect. I am currently using the monitor with my macbook pro and mini displayport which drives the monitor at the full 60hz. This monitor is clearly not for everyone and is not cheap.But if you are a pro or a keen enthusiast then colour accuracy is going to be hugely important to you. This is an excellent 10bit monitor with a stunning screen that has completely removed the problem of colour accuracy from my workflow, saving me both time and money. Its also been a joy to use and the monitor and the image it produces just looks great. Moving forward I'm hoping to do more videos mid week and the all the videos will be a mix of photography vlogs, tutorials and gear reviews. Subscribe if that's something that sounds interesting and leave a comment and let me know what is currently your biggest gear or tech problem. If I can make a video to help you out then that's exactly what I will do. I share my top 10 Photography Apps and Resources that can make your photography better, easier, more efficient and more fun. I often get asked about what apps I am using and why. In the crowded world of photography apps it can quickly get overwhelming. So i've curated this list of apps that I use most often that solve a variety of different problems I encounter on a day to day basis. First up is Lightroom. I talked about the Adobe Lightroom ecosystem a couple of weeks ago but having the ability to edit or tweak your photos on the go is a very nice feature and often saves time. One of the best features of the phone app though is the built in camera that will shoot Raw DNG files. I use this a lot and it's impressive how much control you have of the image in post production. Next up is Photopills. I've mentioned this a few times before. It’s an absolute must for nearly all photographers, especially landscapers. You can plan your shoots, work out exposure times, arrange time lapses, measure hyperfocal distances and it's got a brilliant AR mode that shows where the sun will be setting. It is also perfect for planning milky way shots, subject distances and a lot more. I like it because it brings lots of things into one place and is like a Swiss army knife of photography. Next is the Canon camera connect app. A lot of the new Canon cameras now have built in WiFi which means they will connect to a phone, tablet or laptop giving you remote control of the camera. I've found myself using this more and more in the field. If the camera is low down I can stand and fire the camera from a more sensible position. If I need to change exposure, that can all be done from the app. It is also perfect for video. I used it to monitor myself with the iPad while creating this video and also to focus and stop and start the record. It can be used in situations like weddings. I might have one camera set up to record video whilst I'm taking pictures with another. Its a level of control and multi tasking that just did not exist before. 4th on the list is a weather app. If you ever shoot outside, you'll need one. I use the BBC weather app. It is not always the most accurate but it's easy and you can monitor multiple locations. I also like that it's not always accurate because as a landscape photographer, good images can be captured in every condition. If you only went out when you knew it was going to be nice you'd miss out on a lot. Next is the OS Map app. This is a mapping app for the UK. When you're out shooting landscape photography it's vital for safety to know exactly where you are. I'm going to be talking about this more in future videos, but for a small annual fee you have access to a the OS maps and your GPS position shows exactly where you are. It has helped me out of a few jams this year! Next is 500px. I recently, and finally, started uploading to the photo sharing site 500px. This is a good social platform for photographers where you can see good quality photography without the huge amount of rubbish you see on Instagram. There is also a range of new features for enthusiasts and professionals wanting to sell their work and overall it seems like a good community. Flickr is dead so please check out my 500px page at First Man Photography. Next up is Instagram. You know why. If you're not, you should. Another app from Instagram is Hyperlapse. This is designed primarily to easily capture a Hyperlapse as you walk. It works by digitally stabilising the footage whilst you shoot, giving a smoother shot at the end. You can slow the Hyperlapse down to real time so it's a great way to capture stabilised footage straight onto your phone. It is free and definitely worth a try. Medium is a blogging platform that puts the written word front and centre. It has great content from from the newest writers, to the best writers in the world. I have been writing and contributing to the Vantage publication for a couple years now. It is one of the biggest photography platforms on Medium and has some great articles to get stuck into. Finally we have the humble website. There are some amazing photography resources out there that I consume and contribute to on a regular basis. Blog slights like PetaPixel and Fstoppers, Canon Rumours is always fun, Skippy sky, the OS website, Google maps for planning and getting to places, and of course the First Man Photography website. These apps have saved me time and solved problems for me. They create extra efficiency that just lets me do more and get better and better. Hopefully it can do the same for you.